The custom search which I recently added only lists URLs but another useful tool is Google image search. It can only be set for 1 domain, but as all my images are within the one domain then it is not a problem. Try the following link, even I had forgotten many of the photos!! This entry was posted in Uncategorized on April 30, 2011 by Sharpo. Bewdley to Arley & back on the train for us and 4 locos seen in action. Over the last few months I haven’t taken many SVR photos, mainly because the line had been closed, but also I have taken most of the possible shots so many times before. As usual, I’m lagging behind with uploading photos, there seem to be so many other things taking up my time these days – or I’m just getting slower? This entry was posted in Sharpo's World Photo Updates on April 29, 2011 by Sharpo. The light was much better than the first time I saw it at Shrewsbury on the test run. It is seen passing Warwick Parkway on the climb towards Hatton and with steam to spare. 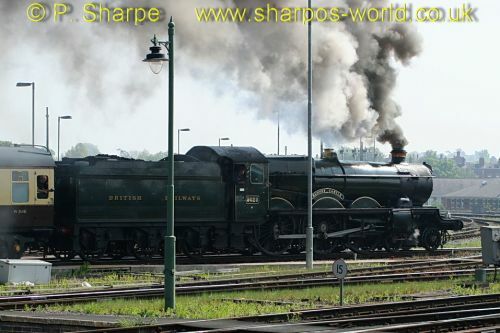 This entry was posted in Sharpo's World Photo Updates on April 23, 2011 by Sharpo. A trip to Shrewsbury to see Nunney Castle on the GBIV tour. My original plan was to go to Hereford, but a railtour heading north with Class 47s made me change my plans. Unfortunately a problem with the stock for the diesel tour caused major delays & I couldn’t wait to see that train. Should have gone to Hereford & I would have seen both trains. I won’t list the units here, but locos/HSTs were – 43303, 43304, 66060, 66183, 66201, 66538, 66597 & 66712. It didn’t seem very busy, probably Easter having an effect on traffic. This entry was posted in Sharpo's World Photo Updates on April 20, 2011 by Sharpo. The DRS Class 47s are seen at Water Orton as they head for Southampton Docks, taking passengers for a cruise on the Queen Elizabeth. This entry was posted in Sharpo's World Photo Updates on April 19, 2011 by Sharpo. The train is seen at Wolverhampton on the return journey to Birmingham International. The sunlight was just right & I was able to photograph the stock as well as the locos. 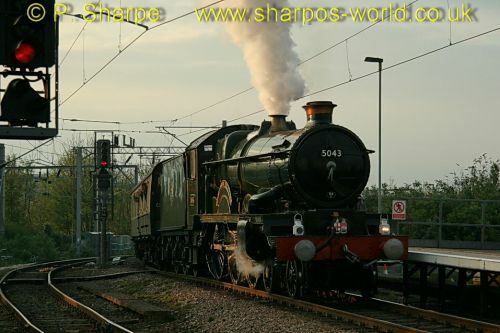 This entry was posted in Sharpo's World Photo Updates on April 18, 2011 by Sharpo. The sun is slowly setting as 5043 enters Wolverhampton on the return journey from Blackburn. After a brief stop to set down passengers it headed towards Bescot for a diesel pilot and would be hauled through New Street on the way to Tyseley. 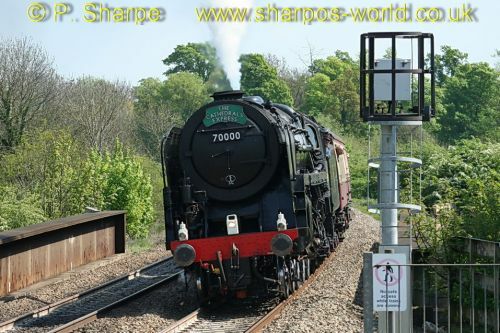 This entry was posted in Sharpo's World Photo Updates on April 17, 2011 by Sharpo. This empty stock working was running via Walsall & Kings Norton. A check on the timetable showed it was possible to see it at Walsall, then catch the train to Kings Norton. It was a few minutes late when we first saw it, but there was still time to catch the Birmingham train to Aston & change to one for the Longbridge line. We were briefly held outside Kings Norton, fortunately it was only for a Voyager off the Camp Hill line, and within a few minutes of arriving the ecs was seen approaching – we only just made it in time, it was a few minutes early! 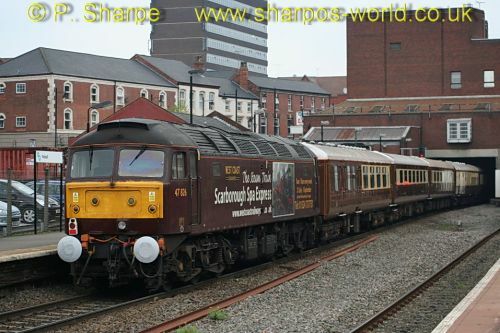 Other locos seen at Walsall were 66550, 66953 & 70006. At Kings Norton we also saw the NMT with 43013 & 43062, an HST with 43207 at the rear & finally 60015, 66050, 66092, & 66953. 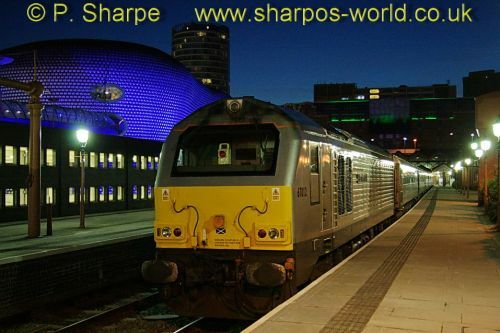 This entry was posted in Sharpo's World Photo Updates on April 16, 2011 by Sharpo. After photographing the 20s at Dorridge, I returned to Moor Street & had about 20 minutes to wait for my train. 67012 and former WSMR set was stabled in one of the new platforms and with no people to get in the way it seemed a good time to try some night photography. Using image stabiliser & 1/30th second exposure the photos have come out very well. 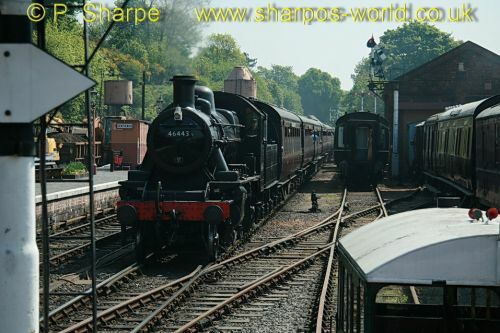 This entry was posted in Sharpo's World Photo Updates on April 8, 2011 by Sharpo. I should have been in Wales, but Arriva Trains failed to get me to where I was heading – I didn’t want to be hours late & also have to tolerate a long bus ride in place of the train and headed back home! So, the opportunity to see 8X09, and in sunlight. 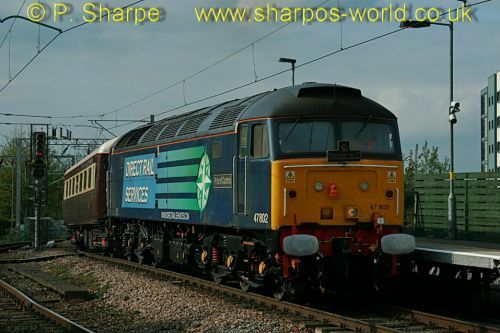 It was due to pass Small Heath soon after 7pm and then head for Dorridge loop. I wasn’t sure if I could see this train twice, but after seeing it at Small Heath, I headed for Dorridge. I was surprised the train was still in the loop, last time I tried something like this – it was “Tangmere” & it ran straight through! Anyway, by now it was after 8pm and it was getting dark, so final photos very poor.